Each request to carry out research will receive a free initial assessment (See Terms & Conditions below). The cost of producing a tree varies according to many different factors. Prices are from £299. 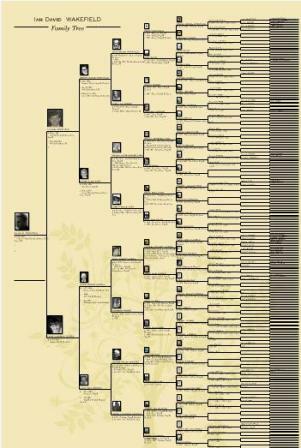 Tracing trees beyond 9 generations usually goes beyond census records and into parish records. For this reason request to take trees this far back will be taken and priced on a case by case basis, please make an enquiry if this is your requirement. Photo’s can be added to the tree for £5.00 per photo please email them with your order. Any Birth, Marriage or Death certificates required will be agreed with you in advance and charged at £25 per certificate. 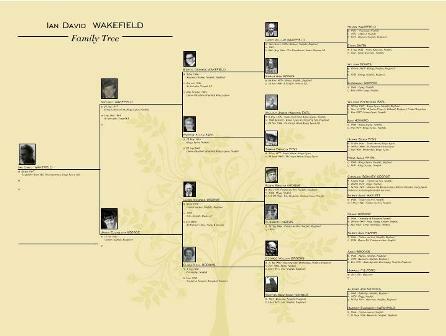 Family Sheets showing siblings for up to 3 generations can be provided for an additional £25. NB For family trees based outside England & Wales there maybe additional charges to enable access to appropriate records, you will be advised of these charges before you make your initial commitment. 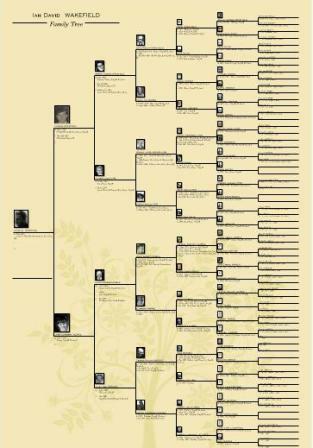 Professionally printed Family Tree in a standard pedigree style, we find this is the best way and most traditional way to present a family tree. Mypastforme will provide you with an estimate based on the information you supply and your requirements. Before work can begin we require a 50% deposit. The remaining 50% will be paid on satisfactory completion of a project. You will be able to view a low resolution of the tree and following your approval of this, payment will be due and the full size family tree will be ordered. Delivery can take 8 weeks or more as it is shipped from the U.S.